It seems to have been the theme of the year...and it is getting a tad boring, but it just goes on and on..rain and mud that is. Unfortunately, last week the mud caused us to have a casualty, when Finesse, who is always so very feminine and refined, went a cropper. Her dignity was obviously hurt but she was also holding up her back leg. So she given some Finadyne and brought into the barn to rest. Initially I kept in her dam ( Holly ), Lady Gaga and Snooty Boots for company. However, Holly and Gaga did not prove themselves to be very sympathetic, and I could see that Gaga was assessing her chances of achieving a limbo under the rails. Hence a change of companions; Sophie, as her best friend was an obvious choice, and Poppet as the most chilled youngster ever, seemed the other perfect choice. They have been inside for nearly a week now and are surprisingly happy. Luckily the barn is very open and they can see out in all directions. A thick straw bed, plenty of carrots and persistent rain outside seems to be making the option a pleasant one. However, Finesse's lameness hasn't improved. When I say lameness, I mean that she won't put her foot down at all. She had been seen by the vet who could find nothing on examination so it was decided an x-ray was required. Thankfully no fractures were found. It would appear that she has bruised her stifle area. She is definitely her mother's daughter....Holly thinks herself pretty precious too! The photo of Finesse is an archive one, because the one taken earlier today indoors is blurred. I am having a bad week on the photography front; on Saturday I tried to take some cria fleece shots, but not one turned out as hoped...if fact all were blurred. The situation wasn't helped by slightly damp fleece, indoor light and lack of man power. Still what I see just doesn't transfer to camera (I know Rosemary this year I was going to crack it but no!). So take my word these are better than the photos suggest! Beck Brow Advantage: Dam; Cambridge Camilla (shared with Explorer) Sire; Waradene St Patrick of EPC. A very fine and dense fleece, bright with high frequency crimp. Beck Brow Foxy Sox; Dam; Beck Brow Fine Romance. Sire; Waradene St Patrick of EPC. 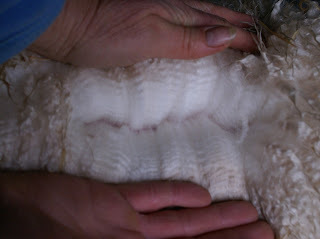 Another fine and dense fleece with 'blinging' brightness not apparent on the photo. Paul has had an accident and he is not enjoying the consequences. You may have noticed the poovering no longer features on this blog. There are no longer any complaints about poo collecting. I no longer have a constant stiff neck or a bad tempered husband (I never knew which was the lesser of the two evils where poovering was concerned). No, all this stopped when we purchased a paddock sweeper. This involves tractor driving, so Paul is happy and the paddocks are clean. Until this weekend that is...Paul has broken his sweeper...it is under warranty and we are waiting for a part...in the meantime it is back to manual labour for his negligence! On Friday I registered the 2012 born cria...all except two that is. 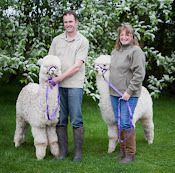 Domingo and Pedro have been sold and as I hadn't yet registered them I suggested that their new owners might wish to choose their names. The boys are waiting...what are they to be called?....will they approve...in the meantime they are 'the alpacas formally known as Pedro and Domingo' it was good enough for Prince! Well done with the fleece shots - I find them very difficult! Hope Finesse improves soon - the mud is lethal here. And I do like to see a man poovering - I shall show that one to Carl tonight!! Andy and I need to try out a pull along poo picker, something like a Trafalgar PC50. If anyone knows a local supplier, or user, could you please let us know. Thanks. Me again, i should have been specific, a local supplier in Yorkshire / Skipton region.. sorry..
Foxy Sox's fleece looks super and I can see the shine from over here!! Hope Finesse soon gets her "finesse" back and is able to use all 4 legs!